Topics: Locks, Security, Upvc, Rates, Commercial, and Clients. 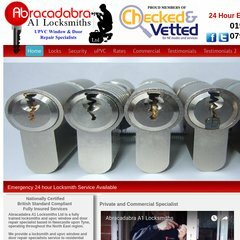 abracadabraa1locksmith.. Newcastle Locksmiths - Rates - Home - www ..
abracadabraa1locksmith.. Newcastle Locksmiths - uPVC - Home - www ..
abracadabraa1locksmith.. Newcastle Locksmiths - Locks - Home - www ..
Its IP Number is 85.233.160.101. ns0.phase8.net, ns2.phase8.net, and ns1.phase8.net are its DNS Nameservers. It is hosted by Namesco Hosting The (England, Worcester,) using nginx web server. PING www. (85.233.160.101) 56(84) bytes of data. A ping speed test response, is timed at 96.3 ms.